These items have something in common. Both are wood plastic composites. The Wopex doesn’t need an introduction on a pencil blog. According to Staedtler’s website it contains more wood than plastic. The cup is a Kupilka, a kind of modern Kuksa. The Kuksa is a traditional cup from northern Scandinavia, carved from birch burr. I was very tempted to buy one when I transferred in Helsinki airport a few years ago, but you’re only supposed to carve them yourself or get them as a gift, plus I mainly drink tea with milk and they’re not so good with milk I heard, so I skipped buying one. Well, this is a modern version and like the Wopex it’s a wood plastic composite. According to the manufacturer it’s 50% pine and 50% thermoplastic. I bought mine in March 2016 for £16.93 (~$23.90; €20.90), including postage, from an Amazon Marketplace seller. I was quite surprise when it turned out that the company that sold the Kupilka is from the city where I live. They even have a Kuksa carving course this autumn. I’m very tempted! I was quite surprised that my cup came with a spoon. I didn’t expect that as no spoon was pictured on Amazon. Massdrop sold these recently, too, and you could even choose between different colours, but I already have my Kupilka so wasn’t tempted by their offer. To see the high-res version of the photos please open in a new tab. You can find reviews of the Kupilka at Hiking in Finland, Black Scout Survival and Sticks Blog. You can find reviews of the Wopex at East.. West.. Everywhere, Stationery Traffic and at Pencil Revolution. The godfather of all Wopex posts can be found at Lexikaliker and there’s a comparison of the different Wopex leads here at Bleistift. This is really cool! It’s nice to see some other uses for a wood/plastic composite. And especially to see some recognition for the Wopex! I own a wooden kuksa (made from birch) and have had no problem drinking tea, coffee, wine, beer or cognac from it. It has stained a very dark brown on the inside now. That was a very good price for a Kupilka cup, I have seen them go for much more. Johnny, I’m also quite excited about these. The material feels quite different. Less uniform and actually more stable, which is probably on purpose to make the Wopex easier to sharpen. What do you mean when you write about recognition for the Wopex? 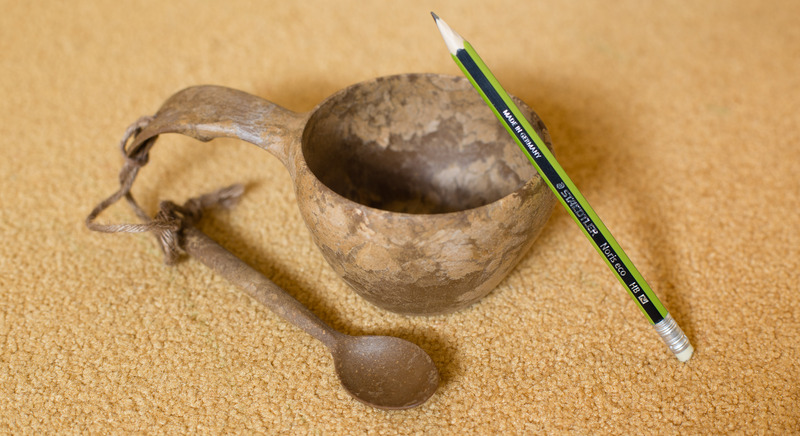 Stationery Traffic, do you drink tea with milk from your Kuksa? How long have you had yours? I thought there price is quite good, too. Especially for the UK.